File photo of gardaí in Dublin in 2017. A NEW APPROACH to Garda training and making members of the force more visible in communities are among the proposals made to reform policing in Ireland. The Commission on the Future of Policing, which has been examining the topic for over a year, published its report today. Introducing the report, Commission chairperson Kathleen O’Toole said the message received from the people of Ireland was “loud and clear”. “Everyone wanted more gardaí working in and with the community. They wanted a modern, well equipped, efficient and professional police service. “It was also clear that the current arrangements for overseeing the police and investigating complaints are complex and confused,” O’Toole said. The Commission recommends a new district policing model, which will make communities the central focus for An Garda Síochána and ensure that gardaí are more visible on the front line. The report notes: “With the protection of human rights as its foundation and purpose, a new definition of policing will include community safety and a stronger focus on harm prevention. Other agencies will work with police in multidisciplinary teams to protect people and prevent crime and communities will have a stronger say in how their local areas are policed. O’Toole said people around the country “attach great importance to community policing, but many complained of a lack of community police visibility”. “We recommend that all police service personnel in the districts will be community police. This is the backbone of police work and the police mission,” she said. A new approach to Garda training and education is also proposed by the Commission, in partnership with higher education institutions around the country. The Garda Training College at Templemore will concentrate in future on specialist police-craft and in-service training. The Commission recommends mandatory in-service training and career development opportunities for all and a funded wellness programme for staff. A new approach to discipline and performance management will be introduced. Under the Commission’s recommendations, sworn and non-sworn personnel will be recruited directly to An Garda Síochána, as part of a single workforce with a shared mission. A Garda Access Programme will be developed to enable the Garda organisation to reflect the diversity of Irish society. The report recommends that the Garda Commissioner should be “empowered to manage the organisation so that it can take ownership of its own future direction”. In addition, a new statutory Board is proposed to “strengthen governance, ensure efficient use of resources and bring greater accountability”. The Commission also recommends that the structure of An Garda Síochána “will be flatter with scope for local decision-making, new ideas and innovation”. Garda resources to support key technology projects will be enhanced and front line police will be prioritised for the early roll-out of mobile technology. The Commission has also recommended a one-off targeted severance package that management can deploy to support restructuring and reform. The report states that a new framework for “the independent oversight of policing and community safety” should be established. The new proposed framework “clarifies democratic accountability through a new system of structured engagement with Oireachtas Joint Committee on Justice and Equality and ensures the focus of the Department of Justice and Equality will be on oversight and policy direction of policing, not day-to-day management”. A new body will supersede both the Policing Authority and the Garda Inspectorate, absorbing most of their functions and taking on new ones. This new body, the Policing and Community Safety Commission, will “ensure greater coherence, more effective scrutiny and a new emphasis on promoting a multi-agency approach to policing and community safety”. The Garda Síochána Ombudsman Commission (GSOC) will have a new name and a new remit to “copper-fasten its independence and deliver an advanced police complaints system”. Under the Commission’s proposals, the new body will investigate incidents and not only individuals, to find fault where appropriate, and identify lessons for the organisation. It will carry out all investigations itself, so that police will no longer be investigating themselves as is now sometimes the case. The report states that the Commission’s recommendations on national security include a new structure to “address evolving complex global security challenges”. A new Strategic Threat Assessment Centre (STAC), headed by a National Security Coordinator, will coordinate security intelligence at a central government level. The STAC will answer to the Department of the Taoiseach. It will have a small permanent staff supplemented by personnel on secondment from An Garda Síochána and the Defence Forces, as well as key departments and agencies, with the specialist expertise necessary to synthesise intelligence and information. An Garda Síochána will retain operational responsibility for national security and a ring-fenced budget for An Garda Síochána’s security and intelligence capability will enable the necessary recruitment of specialist expertise. The Commission notes that this new structure “will require special oversight arrangements”. An Independent Examiner of terrorist and serious crime legislation will be appointed to oversee how security legislation is implemented and to act as an adjudicator on requests for information from oversight bodies where necessary. The report also calls for enhanced capabilities to counter cybersecurity threats and cybercrime. O’Toole said the Commission has compiled a “comprehensive and ambitious but totally achievable programme of reform which will put Irish policing where it needs to be – not just up to date with developments in policing but right at the forefront”. “It will be hard work but it can be done and now is the time to do it,” she added. Garda Commissioner Drew Harris welcomed the publication of the report, which he said “has been written for the benefit of the people of Ireland and will help to deliver better policing”. “The report has over 50 recommendations and many more points of good practice. Some of the recommendations outline significant cultural, staffing, structural and system changes. As such, it is important that we carefully consider the implementation of this report,” Harris said. The Garda Representative Association (GRA) also welcomed publication of the report and said it will be presented to the Central Executive Committee for “further analysis and discussion” next week. The GRA submitted a 70-page submission to the Commission last year. John O’Keeffe, Communications Director for the GRA, said the submission “covered a broad range of issues including recruitment, training, supervision gaps, diversity, culture and ethos, systems failures, transparency, governance and physical and mental well being supports for our members – to name but some”. “One area of critical concern to frontline gardaí is the lack of mental and physical supports available to them,” O’Keeffe noted, adding that a wellbeing report commissioned by the GRA this year found that up to a third of members were the “walking wounded”. A solutions pathway has now been identified in this report where it is recommended that dedicated funding be made available to support our members wellbeing. O’Keeffe added that additional physical supports are also “essential” for members. “As incidents last week in Dublin showed, the issue of independent verifiable evidence is critical when gardaí interact with the public in confrontational circumstances. 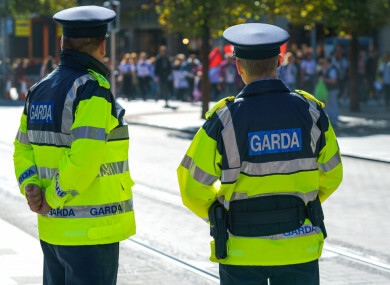 “In this regard, the GRA has been calling for body-worn cameras to protect our members for some time on the basis that they are the true record of any incident.” The report states that such cameras should be rolled out to gardaí. During an eviction at a premises in Dublin city last week gardaí were criticised for covering their faces, a move Harris later said was “not correct”. He added that An Garda Síochána respects the right of people to protest peacefully. The Garda Inspectorate, the Irish Council for Civil Liberties, and the Children’s Rights Alliance all welcomed the publication of the report. The Commission has called for better information sharing between the gardaí and agencies such as Tusla, the Child and Family Agency. “A relationship of trust must be fostered between the gardaí and other agencies including Tusla in the best interests of children. “This commitment echoes a recommendation by Professor Geoffrey Shannon in his audit of An Garda Siochana earlier this year that better information systems be put in place,” Tanya Ward, Chief Executive of the Children’s Rights Alliance, said. Email “More accountability and support for garda wellbeing: 'Sweeping reform' of policing recommended ”. Feedback on “More accountability and support for garda wellbeing: 'Sweeping reform' of policing recommended ”.